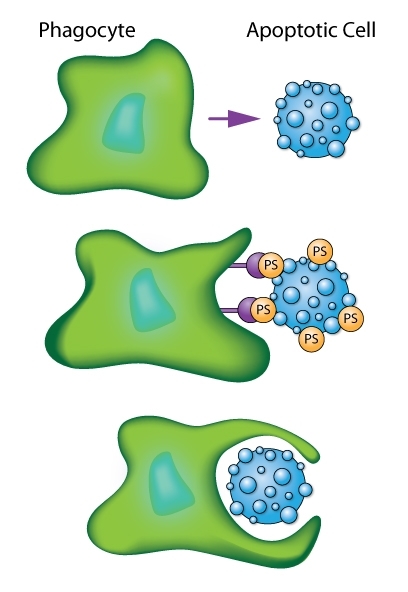 Schematic of phagocytic cell engulfing an apoptotic cell as mediated by recognition of phosphatidylserine (PS) signals. Ismail et al. characterized Tctex-1, a novel binding partner of kidney injury molecule-1 (KIM-1), and described the role both proteins have in efferocytosis, the phagocytosis of apoptotic cells. Efferocytosis is an important function in tissue repair, reducing inflammation and abnormal autoimmune responses. KIM-1 is a phosphatidylserine (PS) receptor and PS is a well-known identifier of apoptotic cells. The physical and functional interactions between Tctex-1 and KIM-1 were examined in proximal tubular epithelial cells (PTECs) which can act as amateur phagocytes. A previously unknown role for Tctex-1 in KIM-1-mediated efferocytosis in PTECs was described. Efferocytosis requires re-organization of the actin and microtubule networks, prompting the authors to examine actin cytoskeletal dynamics and the potential role of RhoA and Rac1 in efferocytosis mediated by Tctex-1/KIM-1. Notably, neither RhoA nor Rac1 activities were regulated by Tctex-1 during KIM-1-dependent efferocytosis in PTECs. These data suggested the unexpected hypothesis that non-canonical pathways not involving RhoA and Rac1 are utilized by Tctex-1. Cytoskeleton’s rhodamine-phalloidin, RhoA and Rac1 G-LISA activation assay kits, and Total RhoA ELISA (Cat. # PHDR1, BK124, BK128, BK150, respectively) were essential reagents in this study, the first to describe the physical and functional roles of Tctex-1 in KIM-1-dependent efferocytosis in kidney cells. Ismail O.Z. et al. 2018. Tctex-1, a novel interaction partner of Kidney Injury Molecule-1, is required for efferocytosis. J. Cell. Physiol. 233, 6877-6895.